Are you searching for ways and intends to make your windows spotless once more? Do you want to know how to skip nuisances like window washing without lifting a finger? 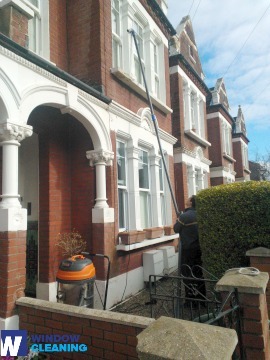 You have chosen the right assistance – the adepts of window cleaning in Upton Park will manage with this matter in short time. Your windows alongside their frames and sills will look perfect, we ensure that! You will no longer have to give up your leisure time – the results of our work will completely fulfil you. Our services blend top-notch quality with affordable price rates, so don't wait – request an estimate now to save time, effort and money! We also provide our professional services in nearby areas: Forest Gate, Cann Hall, Maryland, West Ham, Cyprus. We use advanced methods of window cleaning to guarantee you will get great end results. With our water fed pole cleaning system, jet washing and rope access equipment, you can be sure that your property's glass surfaces will be sparkling. Furthermore, your house is in good hands – the cleaners are completely insured and comprehensively trained. The water fed extension poles are connected to water supply vans, while our rope access ensures safety – even when we clean high-rise buildings. You can profit from these options today – dial 020 3746 3113! You will have perfectly looking work environment with the help of the adepts of commercial window cleaning. You can rely on our high end services for all types of business premises. If you have a small shop, we can completely polish its windows by using water fed extension pole equipment – it gives us the chance to as high as the fourth floor. If you seek flawless look for the glass panes of a skyscraper in London and the neighbouring areas, we will make use of our rope access gear. In any case, you will get superb results immediately. You can always rely on our workmanship and commitment for domestic and commercial window cleaning. Our abilities allow us to clean all types of glass surfaces you could possibly have at your property. For instance, you can apply for cleaning of single or double windows, sash ones, French doors, bay windows and patio doors. Besides that, we include greenhouses and skylights as part of our process. So to speak, you can fully enjoy the good look of your windows with our swift and reliable services. You will see your sparkly clean home after the expert window cleaners in Upton Park visit you. We provide superb services for the entire London locality. The leading methods are included in our working practice – including water-fed extension pole system and and hard pressure cleaning. You will see for sure the change in your home – we use purified water for the process of inside and out window cleaning. Give us a call now on 020 3746 3113. Our customer service agents will guide you and answer any inquiries. Or you can use our online booking from.